Turkey can most commonly be found in barbecue restaurants in the form of a sliced turkey breast sandwich. The white meat on a turkey breast is a healthy and great tasting way to enjoy smoked barbecue. However, there are other ways to enjoy smoked turkey recipes at home. We recommend trying your smoking skills out by trying to smoke a whole turkey. If you are planning to smoke a turkey for Thanksgiving, you may want to attempt a smoked turkey recipe once before Thanksgiving to make sure you don't mess up dinner on your holiday. However, if you follow our recipe directions, you should be on your way to creating a delicious smoked turkey regardless of your experience. 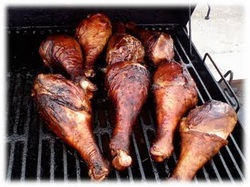 Smoked Turkey Legs - These turkey legs will come off your smoker with a brown, crispy skin with a juicy and smokey flavor on the inside.